Answer: For those not familiar with the term, let me first explain what qualifies as “lake effect snow” (LES). 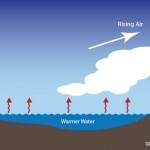 This type of snow often occurs when cold air blows over warm water. Click on the thumbnail below to see NOAA’s LES graphic. The cause of LES is explained by thermodynamics. Water holds its heat much better than air: The specific heat of water is 4.184 J/g°C (joules per gram-degree Celsius). What that means is: You need 4.184 J of energy to change the temperature of 1 g of water by 1 °C. By comparison, the specific heat of air is only 1.020 J/g°C (depending on its temperature, pressure, and humidity). 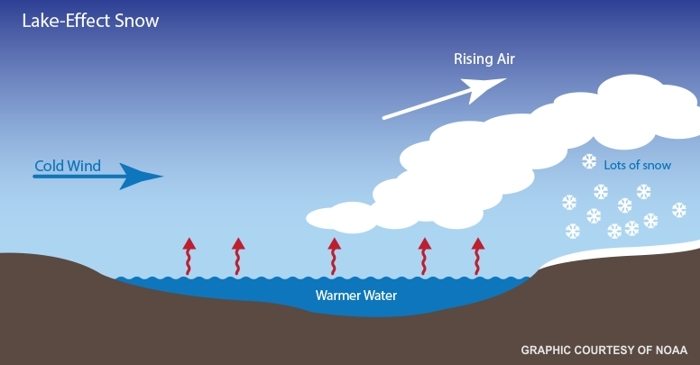 So in compliance with the laws of thermodynamics, when cold air comes in contact with warm water, the air will absorb heat (as well as rising water vapor). The water adds some weight, but more importantly, the heat causes the air to expand. That lowers its density and (like a hot air balloon) causes it to rise. As the air rises, it expands, and its temperature drops via adiabatic cooling. When the air temperature reaches the dew point, visible clouds will form. What happens next is based on how much water those clouds hold, and just how cold it gets. You could have only clouds, as shown in my photo at the top. Those clouds are forming just after sunset, as the air is cooling and the warmer waters of Lake Pleasant (just beyond that mountain range) are still evaporating. We didn’t get any precipitation from those clouds. Under more extreme conditions, lake effect clouds can generate rain, snow, or hail. That said, we can now address your question about the size of lake required for LES. As a general rule, the larger the lake, the more heat it holds, and the longer the fetch (distance over which wind is in contact with water). The longer the fetch, the more heat and water vapor will be transferred. No surprise the Great Lakes are responsible for most LES headlines. At the latitude of the Great Lakes, prevailing winds blow from west to east. Buffalo, NY has some of the largest snowfalls in the US, most due to lake effect. They got 27″ overnight in October 2014. But then, Buffalo is downwind from four of the five Great Lakes, and on the east shore of Lake Erie. On the other end of the size spectrum, even small lakes like Lake Pleasant have generated LES. I’ve seen it twice in the 30 years I’ve lived here, so it’s rare. Lake effect rain is far more common. And the area of Lake Pleasant is only 36 square kilometers (9000 acres), compared to Lake Michigan’s 58,000 square kilometers (14,336,000 acres). When you get to even smaller lakes, the shorter fetch requires more extreme temperatures to produce LES. At the limit, a strong gust of wind could blow water from a puddle into the air, and that water could freeze before it hits the ground. Technically, that would be LES. I’m reminded of this viral YouTube video. Indeed. That number surprised me too. I mean, I knew approximately how long and wide Lake Michigan was in miles, but when I looked up the actual surface area in square miles (22,394) and acres (14,336,000) it put things into a different perspective. Still, it’s only the 3rd largest of the Great Lakes, ranking behind Superior and Huron. Fun fact: The name for Lake Michigan comes from the Ojibwa Indian word “mishigami” which means (appropriately) “large lake.” When you teach, you learn. Thank you Dan for your on going commitment to explaining seemly complicated concepts in terms we can understand. I continue to marvel at the complexity and beauty of our oceans, earth and sky. Glad you liked this week’s post, Linda. I too marvel at the beauty of Nature. That’s why I sometimes just post a pretty picture. If I can manage to teach a little science in the process, great. If not, then maybe the sheer visual impact might spark some interest in science. Thanks for the great explanation. We just have snow coming off Lake Michigan in the southeast corner of the lake. Lake effect snow is fairly common here. Thanks Terry. I grew up on the west shore of Lake Michigan in the city of Two Rivers, WI. We got plenty of LES there too, but in those days they didn’t have a fancy name for it … it was simply snow. Now that I think about it, meteorology in general was pretty primitive back then. Good to hear you enjoy Sky Lights.